What a beautifully-timed deal: a coupon for free hand cream from The Body Shop, just as the cold weather rolls in. Also, as somebody who suffers from chapped hands in the winter and knows her hand goop like Oz Clarke knows fine wine, I can personally vouch for the quality of this stuff. VoucherCodes.co.uk has released a super coupon for a free, 30ml tube of Body Shop hand cream. The coupon can be redeemed from 9 am today, Thursday 19 September 2013. The offer is available while stocks last, with 50,000 hand creams being given away. Download and print your coupon here, or find it via the VoucherCodes.co.uk mobile app. Hemp Hand Protector (usually £5) – This is the one that I recommend for very dry hands. Contains hemp seed oil. Almond Hand and Nail Cream (usually £5) – Contains sweet almond oil and panthenol. Wild Rose Hand Cream SPF 15 (usually £5) – This is the yummy-smelling one in the range. Apparently it also helps to reduce the appearance of brown spots on hands. The 30ml tube is handbag-sized. 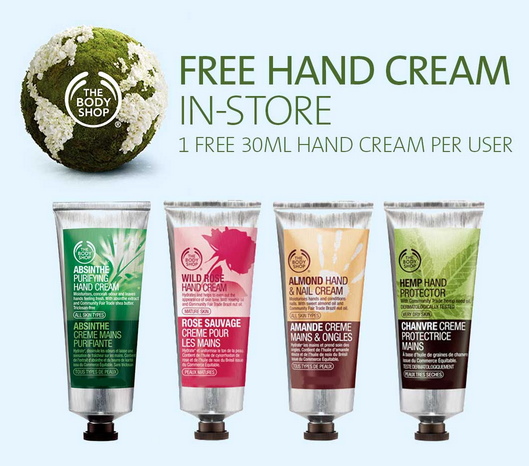 Something you might like to note, before you leave The Body Shop with your free hand cream, is that VoucherCodes.co.uk has a second tasty coupon: get 40% off any in-store purchase at The Body Shop. No minimum purchase, from what I can see. The 40% off coupon expires on Sunday 22 September 2013 though, so if you want to use it, cut a dash to your nearest store. Hooray! Silky soft hands for everyone! P.S. If you grab the 40% off coupon, don’t forget that The Body Shop has brought back its awesome banana hair conditioner. It’s like the 1990s all over again. Thanks for the coupons and I can vouch for the quality of these hand-creams as well; apart from being great on your hands they also smell lovely. Aaahh you beat me to it! I’ve just written this blog post up too. Its a fabby freebie. I love the quality of Body Shop products for the price you can get them at suing codes etc.